Saddle height affects on health safety of the knees and ligaments, but, more importantly, for how long survive the “fifth point”. 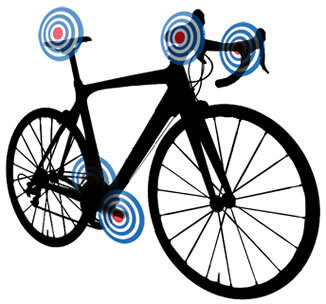 Proper position of the saddle should be determined in the dynamics by using video recording. 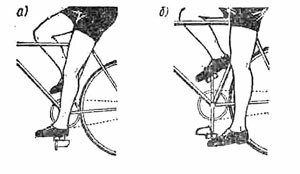 At first approximation you can set the height of the saddle according to the numerous recommendations from the internet and “before Internet.” So at the bottom of pedalling you need be able to straighten the knee to “click” while touching the pedal by heel. But while pedaling when the pedal is pushed not by the heel but by the “pad” of thumb, your should never straighten the leg. 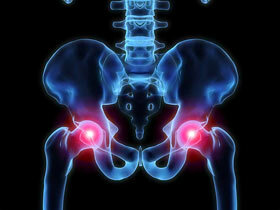 Sometimes it pointed preferred angles of maximum extension of the knee joint, 143-153 degrees. It is postulated that if the leg is too straight, ligaments may suffer, if on the contrary not enough straightened, you are “killing” knees. Of course, this is very reasonable advices, they are sufficient for the rides of 2-3 hours without interruption, and if with stops, perhaps even enough for any distance. Unfortunately, these recommendations are only part of the total picture of biomechanics, and if we consider that part in isolation, then after long pedaling consequences could be bad. I’ll start with the thesis that was analyzed in a previous article that people are different 🙂 Moreover, they are more different from each other than the athletes involved in cycling sport. 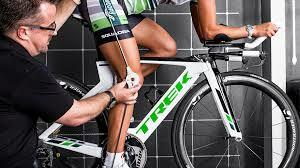 Therefore, striving to bike fit under certain angles of knee bending, installing saddle height by the heel, etc. – it has the same significance for you as “the average temperature in the hospital”. Optimum saddle height depends on the pedaling technique of the individual. The technique of pedaling is not particularly tricky. But it needed to keep in mind that the view from the “inside” of body may be very different from how it looks from the outside (I speak about myself 🙂 ). Therefore it is very important to use independent control by video. I describe my feelings during hard pedaling in the “contacts” (clipless pedals) at the optimum for me height of the saddle. 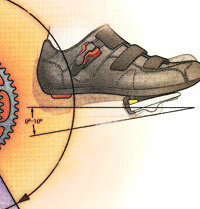 While pedaling (especially uphill) inner sense is “heel down”. The strongest sense of “heel down” when the pedal move down, that is, firstly heel lowers, then toe with delay puts pressure on the pedal. 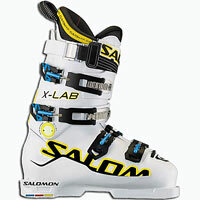 The angle of heel-shin feels the same as in the ski boot. Ahilles a little stretched, but no more than in a ski boot. The inclination of leg forward is static in order achilles not inflamed (was that). That is, not to move the heel “up-down” – once lowered heel while moving down and keep it so to the lower position and a little longer until the feeling that the achilles begins to stretch. Then this feeling of “heel-down” is transferred to the other leg (which begins to move down), while this leg turns into a “hook” that draws up the pedal on clip of “contact”. Thus heel is not lifted up, pull the pedal up by “the toe itself”. In fact (from stop-frames of video recording) heels do not fall down at all, at one frame the sole lays to horizontal position (1), and then the heel is lifted up. 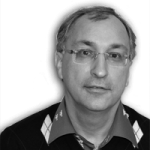 That is the inner feeling – this is internal view, looks outside is quite different. In principle, it would be good that leg in the knee was a little more straight, but kinograms study showed that this does not happen. If to put the seat a little higher, the leg will not be further straighten but the heel raised (2) (even with a feeling of “heel down”) if even higher – starts to crawl back on the saddle. (Such is my legs, “the other participants of the test” could straighten legs more (3) ). Thus, the video recording shows how in fact straightened leg while pedalling. In no pedalling I can easily straighten the leg completely. And I can pedalling with the same feeling, but is not relevant to reality. In my case, affects also the fact that the my legs are different in the dynamics, the right one is more flexible, the according difference in the height of the saddle is 1 cm (eventually put saddle height “based on the right leg”). Return back to the horizontal position of the sole at the bottom. As I’ve wrote in a note about pedalling in a circle, it is not a strict condition. Maybe a slight tilt “heel up, toe down,” especially if the pedals are not “contacts”. However, when focus to long-distance I recommend to adjust the seat so that it would be horizontal sole at the bottom. Here we come to a very important point in the issue of saddle height. 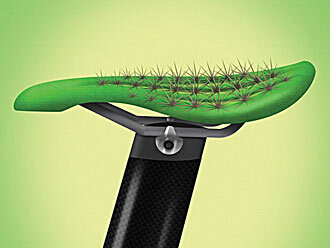 This is necessary not only for pedaling. Moreover, for the race seat can be lifted from the optimal position as far as this will increase the power.